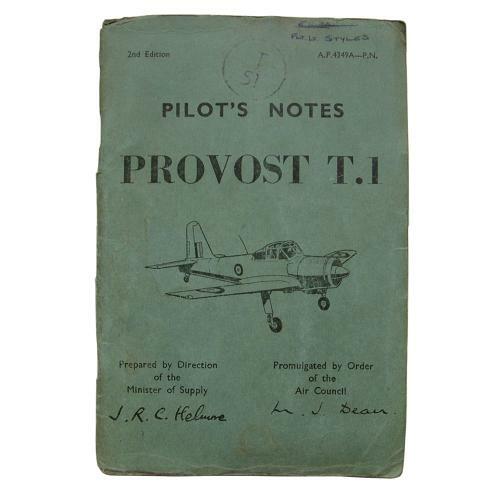 RAF pilot's notes - Provost T.1 in Show Me Everything! A.P. 4349A. Original 2nd edition copy dated 7/55. 42 pages with pullout diagrams/photos. Covers a general description of the aircraft including fuel and oil systems; aircraft controls; engine controls; other controls including canopy operation, cockpit heating and radio equipment etc; Part II deals with limitations, part III - Handling, Part IV Emergency Handling - action in the event of fire, abandoning the aircraft, force landing, ditching etc. Part V has illustrations of the cockpit. The cover is soiled and dog-eared/creased. Named to Flt. Lt. Styles. Internal pages are also a bit soiled and have quite a few amendment sheets glued in place (amended to December 1960). Reasonable/well used condition. Stock code P23234.